What’s Up with Temple and St. Joseph’s hoops? Right now, Philadelphia is a pro football and college basketball town. The Phillies stink, the Flyers are not a playoff team and the Sixers organization has purposely lost games for two straight seasons. Despite the insane levels of irrational exuberance displayed for the Philadelphia Eagles (NFL), college football hasn’t gained significant traction in the region. In fact, I’m pretty sure there are more Dallas Cowboy fans than college football fans in the Greater Philadelphia Region. College football is largely ignored by all but diehard Owls fans and Philadelphia-based Penn State alums. Villanova and Delaware are not BCS programs. They do not play big-time college football. On those rare occasions, when Penn State and Notre Dame are competing for national championships larger numbers of Philadelphians pay attention to NCAA football. For the most part, collegiate athletics in this area, consists primarily of six Philadelphia-based Division 1 basketball programs (Villanova, Temple, St. Joseph’s, Drexel, LaSalle, Penn) competing with Rider, Delaware, Delaware State and Princeton for student-athletes and attention in the Greater Philadelphia region. While interest in college football lags, Philly college hoops matter… But there is a clear pecking order. Truth be told, Villanova basketball is on another level… They regularly play in a sold out NBA arena. They are consistently ranked among the Top 10-20 programs in the nation. Wright graduates all of his players. He is able to land virtually every local recruit he targets. None of the other area programs are comparable to Villanova. Over the past decade, the Wildcats have exhibited an incredible level of success. Wright has led Nova to NCAA appearances in 10 of the last 11 years. Villanova’s big “problem” – if one identifies it as such – is “advancing” in the NCAA tournament. 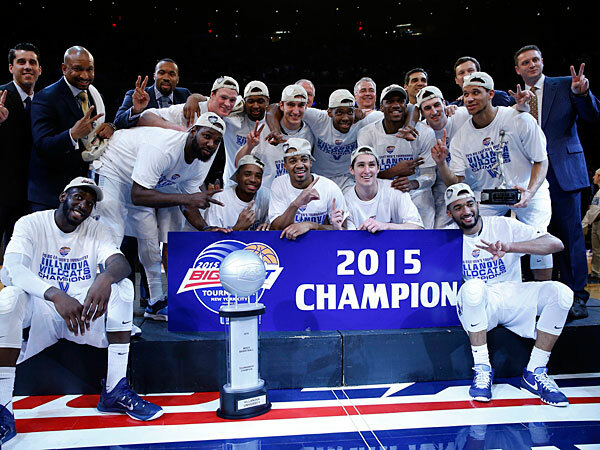 Big East Championships and spots in the Big Dance are expected every year. Villanova basketball gets the most print and television media attention by a significant margin. But the consistent winning… The high graduation rates… The firmly entrenched and highly regarded coaching staff… are all kinda boring. You know Nova’s gonna win a lot of games every year. You know they will make the NCAA tournament. In recent years, they have struggled to make out of the first weekend. That’s a good problem to have. Less discussed and, undoubtedly, more interesting developments are unfolding within the Temple and St. Joseph’s basketball programs. Over the past 25-30 years, these programs have each had only two head coaches. Coaching changes in City 6 basketball programs occur less frequently than Papal Inaugurations. However, dissenting voices emerged within each program’s fan base over the past couple of years. They did not receive a lot of coverage in local print and internet media. In both cases, the self styled ‘loyal opposition’, was a consistent presence on message boards and other websites. Before he won the A10 Championship in 2014, a “Phil Must Go” website emerged and a few hundred extremely loud hawk fans were calling for Martelli’s ouster. In fact, there were very strong and sustained chants of “Fire Phil” during the home loss to Villanova. It was bad on Hawk Hill… Fast forward three months, that Hawk team won the A10 Championship. After posting a 9-22 record in 13-14, many Temple fans questioned Dunphy’s ability to right the ship. His ability to recruit Philly and other urban areas was frequently called into question. The next year, with a strong contingent of Philly players, Temple won 26 games and reached the NIT Final Four. Temple Athletic Director, Kevin Clark and President Neil D. Theobald have, apparently, committed to Dunphy (pictured above) and, his heir apparent, Aaron McKie. This makes a lot of sense. Despite it’s national gridiron aspirations, athletically, Temple is a Philly school first and a basketball school second. Clark and Theobald can pursue BCS football aspirations and leave Temple basketball in capable Philly hands. Dunphy and his staff are proven winners and continue to demonstrate an ability to develop and maintain strong relationships with Philadelphia and Baltimore/Washington, DC based AAU/grassroots programs. These AAU/Grassroots programs are the lifeblood of college hoops. 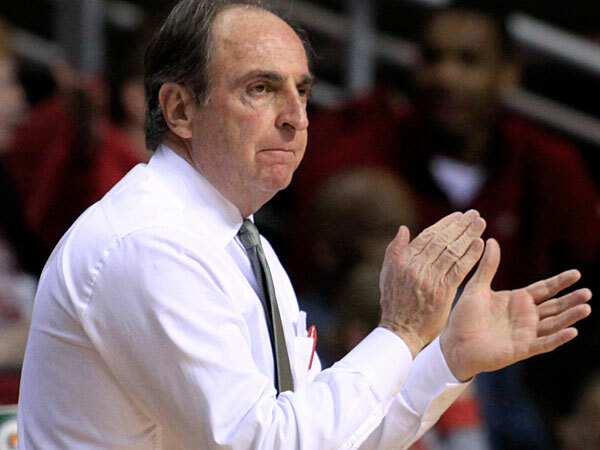 After one losing season (13-14), Dunphy quickly regrouped and led the Owls to an appearance in the NIT Final Four. As you can see in the chart below, Dunphy has been a very consistent winner over the course of a career spanning a quarter century. On the few occasions his teams posted losing records, Dunphy was able to quickly rebuild and compete for Conference Championships and NCAA appearances within a season or two. Dunphy is a very good and highly respected basketball coach, without a doubt… In recent seasons, we’ve seen him defeat Jim Boeheim (Syracuse) and Coach K (Duke). Last December, Temple knocked off Bill Self and nationally ranked Kansas in a 77-52 blowout. That win snapped the Jayhawks’ eight-game winning streak. The last time we saw Dunphy’s team, they were ending an impressive postseason run in the National invitational Tournament. Temple fell 60-57 to the University of Miami (25-12) at Madison Square Garden in the NIT Final Four. Dunphy has a lot of talented players. At 6’8”, freshman Obi Enechionyia displays a high ceiling and a considerable offensive skill set. Obi plays within himself, he shows great poise. His game is highly fundamental. He can go left and right and does a good job of using his athleticism on offense. Obi is a rapidly developing big forward capable of providing the Owls with consistent scoring, rebounding and shot-blocking over the next three seasons. Offensively, he’s shown flashes where he overpowers opponents and bangs on people around the rim. He also has a nice little mid-range jump shot. Joining Obi and the upper classmen next season will be three highly regarded high school recruits. Levan “Shawn” Alston Jr. (Team Final/Haverford School), Trey Lowe (Team Final/Trenton Catholic) and Ernest Aflakpui (We R 1/Archbishop Carroll) are ranked among the best HS prospects in the nation. Dunphy says, “It’s a great grouping of guys to come in [during] one year. I think they’ll have terrific careers here. They all bring a little something different to the table.” Alston is 6’4” 175 pounds a four-star SG/PG. Lowe comes in at stands 6’5” 165 pounds. He’s a three-star WF/SG and Aflakpui is a 6’9” 230 lb three-star PF recruit. Next year, Dunph will have a core of solid veterans – Jaylen Bond, Josh Brown, Daniel Dingle, Quenton Decosey and Devin Coleman – to mix with the highly acclaimed young players. With Aaron McKie (pictured below) serving an apprenticeship under Dunphy, the Temple program is positioned well for a period of sustained success. Over on City Avenue, things are little more complex and uncertain… Compared to the relatively steady ride enjoyed by Temple fans, Martelli has taken his program to higher highs experienced lower lows. Just 15 months ago, Martelli’s program sat at the top the tough Atlantic 10 Conference (pictured below). Last season, however, his squad finished 10th with an overall record of 13-18. But as Martelli enters the final year of his contract, there’s reason for optimism on Hawk Hill. Phil’s got some good players again. Over the course of his career, Martelli has been able to recruit highly talented players and build winning teams around them. His most vocal critics focus on the rebuilding years between the winning seasons. Martelli won with Yah Davis and Rasheed Bey in 1997. Marvin O’Connor, Jameer Nelson and Delonte West led the Hawks from 00-01 to 03-04. Calathes and Nivens led the Hawks to the NCAA tournament in 2008. That year Saint Joseph’s President Timothy R. Lannon, S.J. 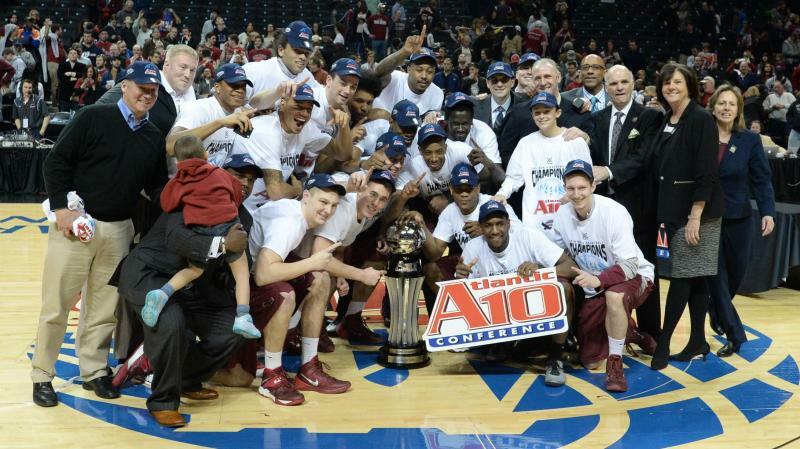 gave “clear indication of the University’s support of men’s basketball and of Phil Martelli…. [and] extended Martelli’s tenure at Saint Joseph’s through the 2015-16 season.” After two consecutive NIT’s, in 2014, Martelli led St. Joseph’s to the Atlantic 10 Championship and an automatic bid in the NCAA tournament. That Hawk squad was led by Langston Galloway, currently starting as rookie for the New York Knicks, Ron Roberts and Halil Kanecevic. In what some observers considered a bit of a surprise, St. Joseph’s chose not to extend Martelli’s contract after he took eventual National Champion UConn to overtime in the 2014 NCAA tournament. For those more familiar recent developments at St. Joseph’s, it would have been a surprise if St. Joseph’s did extend Phil. Saint Joseph’s like many private and Catholic Universities across the country experienced difficulty with consecutive unexpected multimillion-dollar shortfalls. The administration responded by cutting budgets and working to increase enrollment and class sizes. The acceptance rate hovered around 80% and there was low morale among faculty and staff. Last year, Saint Joseph’s professors censured the whole administration in September. In March, it took a no confidence vote in two senior administrators. In April, senators passed a resolution urging university to cut its ties with its current board chairman once his term expired. The business school faculty voted no confidence in the president, the Rev. C. Kevin Gillespie, and the Senate Executive Committee warned the incoming board chairman the whole Senate was prepared to do the same. There was a need for a change. A couple of weeks ago, Saint Joseph’s chose Mark Reed (pictured above) as the first lay leader in the 164-year history of the school. 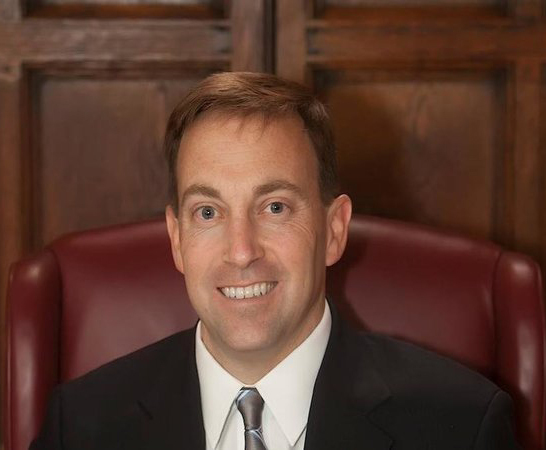 A Philly native, Reed graduated from St. Joseph’s Preparatory School in 1992. In his most recent position, he was senior vice president and chief of staff at Fairfield University in Connecticut. Reed is replacing the embattled Rev. C. Kevin Gillespie, who is stepping down after a three-year term. So what does this mean for St. Joseph’s basketball? Change is likely on North Broad Street and City Avenue over the next 3 to 5 years. What will it look like? At Temple, it appears that a succession plan is in place. 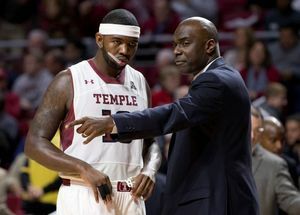 Aaron McKie seems poised to assume the reigns at Temple University whenever Dunphy turns in his clipboard. How will things play out at St. Joseph’s? To a large extent, it depends… When blessed with talented players, Phil has been known to make runs… He could have a much improved team in the final year of his contract. 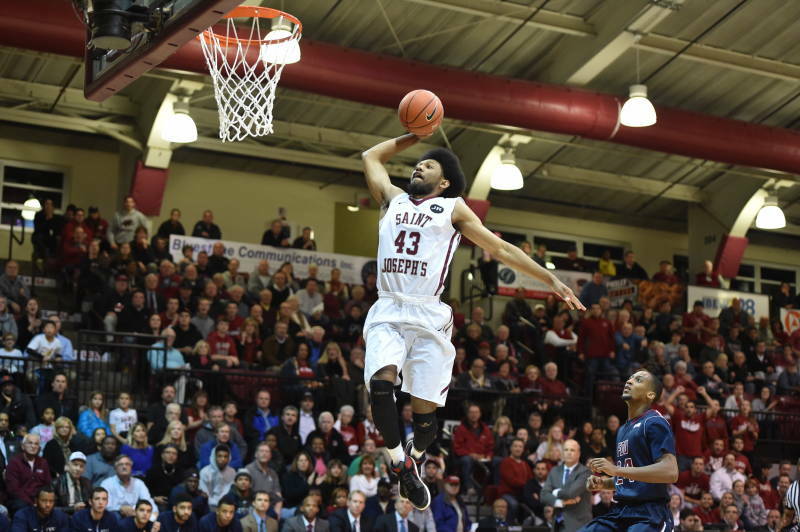 He has the most talented player, DeAndre Bembry (pictured above), in the Atlantic 10 and the Big 5. Can Phil build a winner around the uber-talented Bembry? Who, if anyone, will rise up and become a credible “Robin” to Bembry’s magnificent “Batman”? Will it be one of the new comers? Like Dunph, Phil can still land good players in the Philadelphia region. Recruits Chris Clover (Philly Pride/St. Joseph’s Prep) and LaMar Kimble (Team Final/Neumann-Goretti) are highly regarded Philly Catholic League players. Will one of the youngbucks help Bembry lift the Hawks into contention? Perhaps… But a far more likely source of the boost is the current roster. After missing all of last season, Markell Lodge and Papa Ndao could be big contributors for Martelli next year. Lodge will bring an exceptional level of athleticism to the SJU front court. Lodge is immediately the best athlete on the team and one of the best in the Atlantic 10. His explosiveness and athleticism is comparable to that of former Hawk Ronald Roberts. Although the video below is over two years old, it allows one to see the raw athleticism Lodge brings to the table. Additionally, Papa Ndao (pictured below) brings a sweet shooting stroke and significant experience. He has been part of the SJU program for more than four years. Ndao has demonstrated an ability to hit perimeter jumpers, even 3 pointers, when open. He is a solid rebounder and capable of defending the PF and WF positions. Papa will add a some new dimensions to Martelli’s attack next year. Will the addition of Lodge, Ndao and the freshman be enough? Will St. Joseph’s play in a post season tournament next season? If so, would that warrant a long-term extension for Martelli? How should President Reed and his Athletic Director evaluate Phil? Those are important questions that will be hotly debated on Hawk Hill. 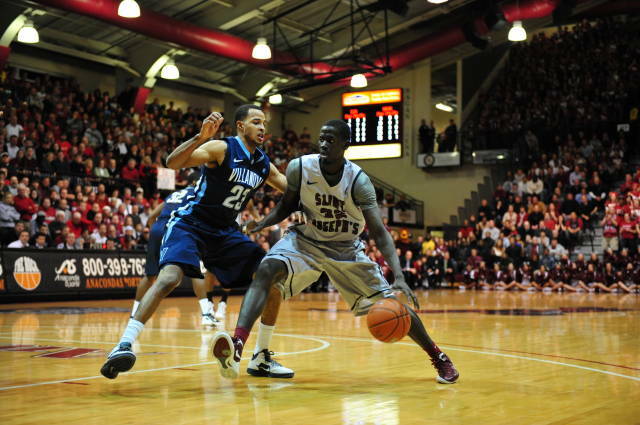 Over the long and proud history of Saint Joseph’s Basketball, the Hawks have participated in 19 NCAA tournaments. Martelli (pictured below) has led six of those teams. The Hawks have made 16 NIT appearances. Martelli coached six of those teams. He’s reached the NCAA Tournament Sweet 16 twice (1997, 2004) and the Elite Eight once. He was Naismith National Coach of the Year in 2004. He became Saint Joseph’s all-time winningest coach four years ago. Phil’s had a pretty good run at St. Joseph’s. He shows no sign of wanting to place his whistle in the drawer. He’s recruiting aggressively giving every indication he plans to coach St Joseph’s beyond next season. As noted earlier, Saint Joseph’s is experiencing difficulty with budget shortfalls by cutting budgets and working to increase enrollment and class sizes. Does Dr. Reed continue the longstanding tradition of identifying the most qualified Hawk to succeed Phil? 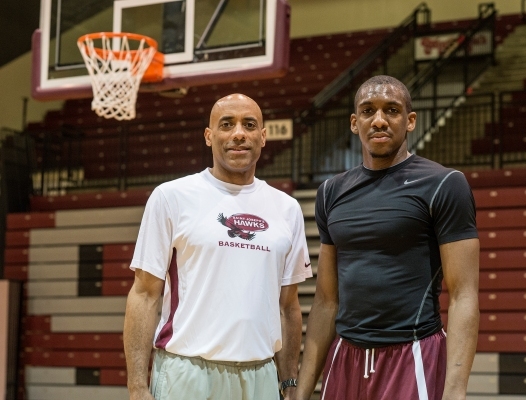 Geoff Arnold and Mark Bass are former Hawk captains and members of the Saint Joseph’s University Basketball Hall of Fame. Dave Duda has been a hard working and loyal Hawk assistant for a decade. Among followers of Temple basketball, it is widely assumed that Aaron McKie will assume leadership once Dunphy retires. McKie is alum of both Simon Gratz and Temple University. A former 1st round draft pick McKie played in the NBA from 1994 to 2007. He joined the Philadelphia Sixers coaching staff in September 2008. He joined the Temple staff in August 2014. McKie solidifies Temple’s stature in Philly’s AAU/Grassroots community. While Temple continues to recruit at a national level, they have also placed increased importance on the Philadelphia region. The strategy has paid dividends. Temple’s incoming class has two Team Final (Rob Brown, Director) alums and one from We Are 1 (Terrell Myers, Director). These AAU programs have consistently produced Division 1 prospects over the past 5 years. This year, Temple is once again heavily recruiting current players in both AAU programs. Led by Dunphy and McKie, Temple will continue to be force in the recruitment of elite local prospects. 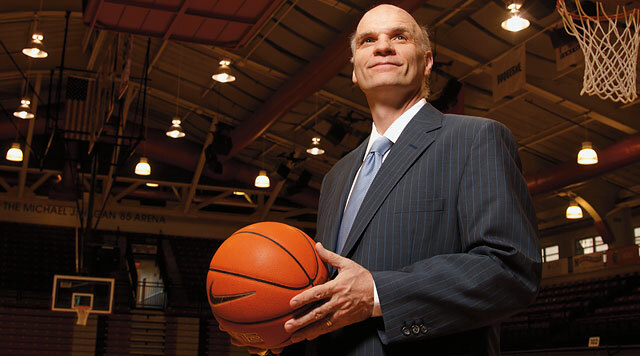 Saint Joseph’s, led by Martelli and Geoff Arnold (pictured below), has also made significant inroads within the local AAU community. SJU has a Team Final (Lamar Kimble) product and a Philly Pride (Chris Clover) alum in it’s incoming class. They will join public league product Jai Williams. A current Philly Pride player, Charles Brown, has exhibited a strong desire to play on Hawk Hill. By all accounts, the Hawks are a force on the local recruiting scene. Will Arnold, Bass or Duda emerge as the heir apparent to Martelli? Does President Reed make a run at Jameer Nelson? Will Phil coach St. Joseph’s beyond next season? A lot of questions at SJU? How much juice does Phil have? Temple fans and area AAU programs know Aaron McKie will be with Temple going forward. President Reed… What’s up with Saint Joseph’s hoops? I believe the $2.1+ M compensation number for Phil may not accurately reflect his annual compensation. While the data does show that for one calendar year it appears to be an aberration where perhaps a significant amount of deferred compensation was paid out. While I choose not to publish the actual data I suggest that to get a more complete picture the author reviews the publically available 990 Forms for Saint Joseph’s University. These show that the coach’s compensation for the previous two years was just over 30% of the quoted amount with an additional 6 or 7% earned in a retirement or deferred category. Nonetheless in a Division 1 school without football the men’s basketball coach is often the highest paid employee and it is true that SJU had back to back years with significant shortfalls in budgeted projections. But as the incoming President and his team consider a contract extension for Phil while remaining sensitive to the budget cuts and slight increase in contribution for healthcare benefits facing all employees it doesn’t appear that a multi-million dollar contract would be part of the discussion. I appreciate the read and thank you for the additional compensation information. Our readers are sports fans. We just wanna know how these dynamic affect the team. I feel that Phil Martelli is an experienced and successful college basketball coach. College coaches with multiple post-season appearances a couple sweet 16’s an elite 8 and a Naismith are well compensated. Whatever Phil negotiated in 2008 is absolutely fair compensation. It is the outcome of conditions and consideration prevailing at that time. Look at the above link, Phil has more accomplishments than a lot of guys making good money. One other person with ties to the St. Joe’s basketball program who likely would be a serious candidate to replace Phil Martelli quit or be forced out at St. Joe’s is long-time Drexel head coach, SJU alumnus, and Philadelphia native Bruiser Flint. In most observers eyes, Flint has done a fine job during his 14 seasons at Drexel. Additionally, Drexel has been negatively impacted the last few seasons by membership changes in its conference, the Colonial Athletic Association, that have weakened the conference in most observers’ eyes. Though I personally think Phil Martelli has done a very fine job at St. Joe’s during his two decades as head coach and I do not want to see him leave, Bruiser Flint could be a good, mutual fit with St. Joe’s should the university decide not to retain Martelli as the head coach.